NEW YORK (CNNfn) - You've organized that shoebox of receipts and inked a list of long-term financial goals, so now you're ready to get started making your nest egg grow. But in an era of do-it-yourself investing, you're the type who gets queasy just thinking about making big financial decisions on your own. So you've decided that you need someone to tell you where to invest your money and you're willing to pay for those professional words. But how do you know you've chosen a reputable adviser and that they're not taking you, or your investments, for a ride? "Some people like to have a hands-on approach, others are in a certain time of their life which triggers them to go to a CFP," said Scott McDuffee of the Financial Planning Association, referring to certified financial planners. "They're looking for a third-party, objective point of view." With more than 35,000 certified financial planners out there, there's plenty to choose from. But what does it mean when an adviser tacks those three little letters - - CFP -- after his or her name? CFPs are licensed by the Certified Financial Planner Board of Standards and are members of the Financial Planning Association. They must pass a 10-hour exam, have at least three years experience as a planner or assistant to an adviser, agree to work under a code of ethics, and pay an annual $150 licensing fee, according to Noel Maye of the Board of Standards. How to prep for your first meeting with your financial planner. CFPs must renew their licenses every two years and complete continuing education courses periodically. So after fumbling with the calculator punching in your expenses and savings, you realize you have a few thousand dollars to invest. How much is that going to cost you in fees and commissions? It depends on whom you choose, financial pros say. Fees can vary among advisers depending on their years in the business and what city their practice is in. "(The Board of Standards) has no guidelines on fees," Maye said. "We don't get into their practices; we don't say 'Charge this.' " But Maye notes that a CFP in business for 15 years may charge more than a newcomer because he brings to the table more experience and expertise. So if you're looking to begin a long-term relationship with an adviser, a project fee or flat fee may be in your best interest. If you think you're going to have only a few sessions with a planner, however, an hourly fee may make more sense for you. A commission-only planner is paid when you buy specific products he recommends to you, like mutual funds or insurance. Fee-based or fee-offset planners charge both a fee and receive commissions from selling products. While your friends are discussing the latest trade they made in their online brokerage account, you're ready to find a professional who you can talk to one-on-one. To locate a CFP in your area, contact the Financial Planning Association or use their PlannerSearch found on their Web site. What is your minimum investment amount? Are you paid by fee, commission, or both? What types of paperwork would you like to see during a first meeting? "Once you get beyond the competency issue, you get into the area of personality," said Diliberto, a CFP in Philadelphia. "You're establishing what should be a long-term relationship." So go with your instincts. If the adviser is cordial and answers your questions, you may have a hand-in-glove fit. If the planner avoids your questions or pushes products on you that you're not interested in, maybe you should shop elsewhere. "It's all about trust," McDuffee said. "That's probably the primary thing after a first meeting. Trust their advice and be comfortable with them and their work style." Above all, know what you want before stepping into a professional's office, financial experts agree. Figure out your long-term goals, whether it's for retirement, estate planning, buying a home, or planning your child's future education. "Walking into a planner's office and saying you want to beat the S&P 500 (index) isn't a goal," Diliberto said. Maybe you suspect your CFP isn't making the investment decisions you outlined when you first met. How can you be sure he's all that he's cracked up to be? 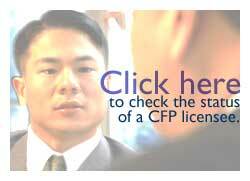 First, if your financial planner claims to be a CFP, check that he's licensed with the Certified Financial Planner Board of Standards, a professional designation similar to the Federal Bar Association for lawyers. The CFP exam has a 57 percent pass rate, according to Maye. "The test attempts to have people apply their theoretical knowledge to case studies," he added. Checking with the Board of Standard's will tell you whether an adviser's license has lapsed, been revoked or suspended. To file a complaint about a CFP, contact the Board of Standards at 888-CFP-MARK. -- Click here to send e-mail about this story to Staff Writer Jennifer Karchmer.